I use this tinted sunscreen every day. It looks luminous and smooth. At night I sometimes add a little of my face makeup to the product for a little more coverage. Works great. Looks great. 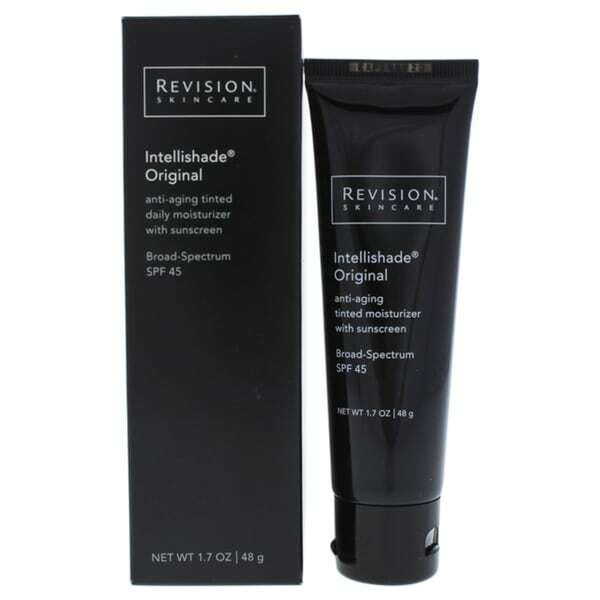 Protect your skin and enhance your tone with this tinted moisturizer from Revision. This all-in-one Intellishade moisturizer hydrates your skin while protecting it from the sun. Apply Intellishade evenly to face as part of the last step in your morning skincare routine. Can be worn alone or with make-up. Apply liberally 15 minutes before sun exposure (see Drug Facts panel on packaging). Can be used with Vitamin C lotion 15% or 30% for added antioxidant protection. Octinoxate and Octisalate: Provides UVB protection. Dimensions 8.5" X 2.5" X 2.5"
Great color and sun protection. I have worn Revision Intellishade for several years. I love the tinted coverage and sun screen protections. It has truly been a life saver! This product is an all-in-one product. It is a moisturizer, a 45 SPF sun screen, and an anti-aging cream. As a plus, it is tinted so I do not need to wear a foundation. I wear this product most days and especially in the summer when I am out on the lake a lot. This product was recommended by both the dermatology and plastic surgery departments at my health provider. However, the cost has risen 50% in the last few years so I decided to try other products. Nothing worked as well for me! So, I decided to go back to this product but looked for a cheaper source. I found it on Overstock. I have been pleased with my previous purchases from overstock and this was no exception. I love Revision Intellishade and have used it for years. Was pleasantly surprised to discover that Overstock sells it. This antiaging moisturizer is also a sunscreen which evens out skin tone. I apply in the morning and this alleviates the need for foundation for me. My dermatologist recommended this product and gave me a sample. I have been using it for about 3 years and love the fact that it matches any skin color so you don't see any lines. I would highly recommend this product. Even though this product seems pricey, it is great! When I consider that it is a moisturizer & spf 45 sunscreen, plus anti-aging ingredients-it’s amazingly reasonable for the value received. I recently used it while hiking in the desert, and it provided great protection from a very high UV day. I am hooked! I love this tinted moisturizer. It is the best I have ever used. The color blends perfectly but is does need to be rubbed or use a make sponge to evenly apply it. I never get breakouts from it. I feel like it heals my skin! This is the only moisturizer I use. It has just enough tint in it to appear like you are using makeup. Hides flaws well and the sunscreen is important. If you could give it up to 5 stars I would give it a 10! MOST. AMAZING. MOISTURIZER. EVER. This is an absolute must have for anyone who wants to age gracefully. This is the first product I've ever used that actually reverses the aging process. Since buying this in February of this year, I have noticed that the wrinkles I was starting to see on my forehead are barely visible. I couldn't believe it! I'm always very skeptical of products, but this is one product I definitely will never give up! Like this product. Great for minimal coverage. I have very oily skin and this doesn’t make my skin feel greasy. Love this product! Never going back to any other moisturizer! This gives just enough coverage and I like the finish. Will buy again! Love this moisturizer. It is slightly tinted and has a great sun screen too. I was excited to try this product and couldn't believe Overstock carried it. I was looking for a tinted moisturizer and this was touted as "the best." But honestly, I found it sort of "meh." It certainly isn't moisturizing and didn't do anything for my skin. I didn't expect much coverage, but it really gave none. I didn't finish the tube and moved onto something else. Even coverage and easy to apply. I use it every day. I've used this product for 6 years and absolutely love it! It was recommended by my dermatologist.